The high Victorian Gothic All Saints Church in Margaret Street is a magnificent Grade I listed building. All Saints Church in Fitzrovia has been chosen for the funeral of Philip Gould who has died aged 61 after a battle with cancer. Lord Gould who was a key strategist of New Labour and adviser to former prime minister Tony Blair, died Sunday night at the Royal Marsden Hospital London. The service will be at 4pm on Tuesday 15 November in the magnificent Grade I listed church. Philip, Labour peer and strategist passed away peacefully on 6th November 2011 after a four year battle with cancer. He was surrounded by his wife Gail and two daughters Georgia and Grace. The Funeral Service will be held on Tuesday 15th November at 4pm, at All Saints Margaret Street, London W1W 8JG. Family, friends and colleagues welcome. No flowers please. Donations can be sent to the Royal Marsden Cancer Charity, 6 Fulham Road, SW3 6JJ, or online at www.royalmarsden.org/donate. Funds raised will be held and used in Philip’s memory for the research and treatment of oesophageal cancer. 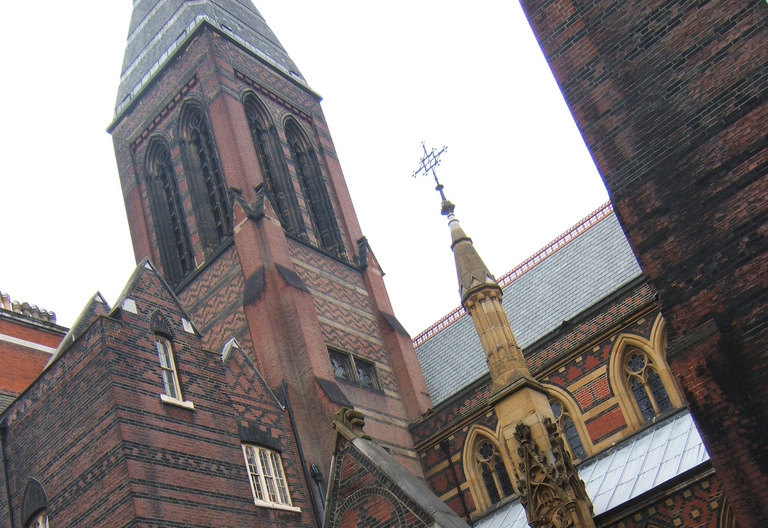 All Saints in Margaret Street has the second tallest church spire in London. It was built in High Victorian Gothic style by the eminent architect William Butterfield during the 1850s and consecrated in 1859. A church had existed on the Margaret Street site since 1760. By 1845 it had become a centre of Tractarian worship and the minister was determined to build a more appropriate church on a large and splendid scale in the Gothic style of the late 13th and early 14th centuries which would bring church architecture, arrangement, and liturgy closer to its pre-Reformation roots. The Ecclesiological Society advocated use of the Gothic style, the use of honest materials and ornament that should highlight, rather than dominate the structure. It was also to express the attitude of the Tractarians to try to convert city dwellers to Anglicanism, believing this to be a social service. In this mission, the ideal model of a church would be a fortress, strong and tough, just like their urban setting. All Saints is built of brick. The Ecclesiologists had originally extolled the virtues of rough stone walls, but were converted by the brick churches of Italy and North Germany. The pink brick chosen by Butterfield was actually more expensive than stone. The bold chequered patterning is most likely to have been based on English East Anglian tradition. The site was just 100 feet square for a church, choir school and clergy house. The church is set back from the street with a small courtyard, and the buildings to left and right are also by Butterfield. The inside of the church is a kaleidoscope of coloured tiles, brick, painting and gilding. It uses highly coloured actual materials as opposed to coloured surface decoration. There are a series of large tile pictures on the walls, encaustic tiling in geometric patterns, and a wide variety of costly stones used in the pillars and other internal features of the church. The interior decoration was meant to embody a ‘beauty and holiness’ which was to highlight All Saints as a living presence within the community. The walls are decorated with multicoloured patterns. Butterfield juxtaposed differing textures against one another. The floor and lower walls of the church are tiled in purple, yellow, slate blue, white and black, and show zig zags, squares, hexagons and stars. The aisles have arches on pillars of red granite, with capitals of alabaster, and the ornate pulpit is also in a variety of coloured stones. Butterfield’s tiled floor, made by Minton, is deep red with black checks and a white stone diaper, while the north and south aisles have a triangular variation on this pattern. The roof, now repainted to the authentic 1895 scheme is in deep chocolate brown timberwork with architectural lines brought out in white, blue and chrome orange.